Zanzibar comes from WMS and it’s a slot machine with a clear Arabian inspiration, with images that include Arabian horses, a desert oasis, jewelry, intricate daggers and all sorts of other objects with beautiful craftsmanship. The inspiration is clear here, but the theme and the story behind it is less so, though that’s not unusual for this industry. The game appears to be a pretty typical WMS game in most respects, so you know what to expect if you’re familiar with their work. In Zanzibar, you will discover 5 reels, 30 paylines and prizes that only go up to $1,500. You can get free spins, scatter symbols and wilds from it. 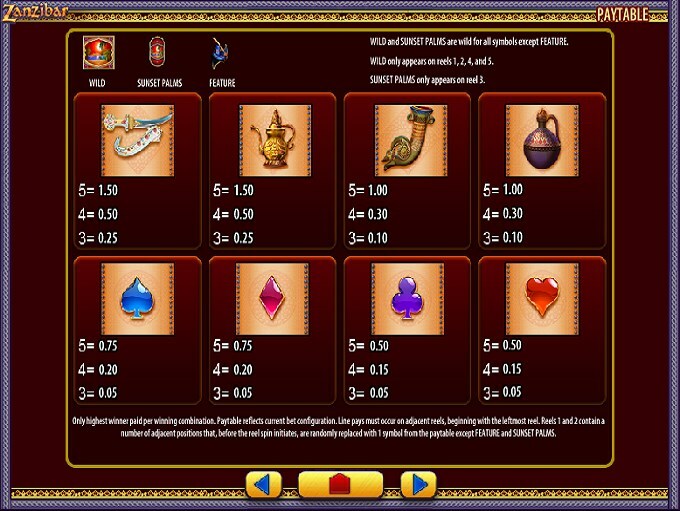 What you can expect from Zanzibar are the usual features, with wild symbols present, with scatters, free spins and multipliers all being in place. To start with, let’s talk about the wild feature, the game’s most important one. It not only substitutes for the symbols which need its presence, allowing you to form more combinations, it also creates some of its own. 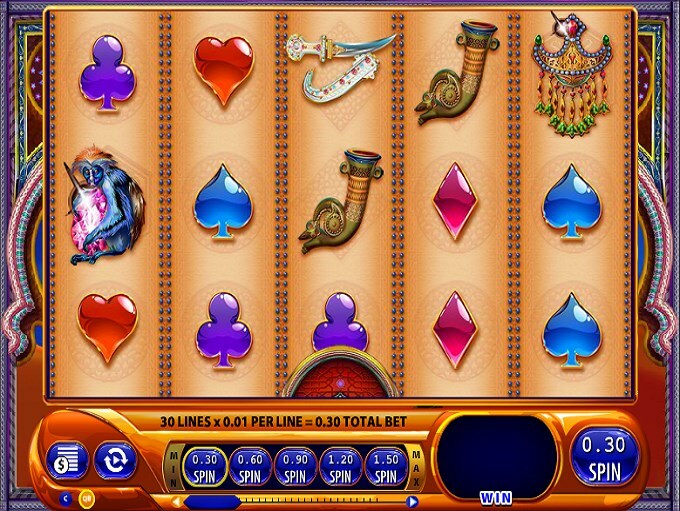 To form combinations directly, it has to land on an active payline, with three to five wilds arranged from left to right. The payouts reach 500 coins, which is the best prize that the game offers. This wild appears on the reels 1, 2, 4 and 5. A secondary wild is used in the game, with the Sunset Palms icon. This one is used together with the regular wild to form its combinations, and it is present only on the 3rd reel. When it appears there, it triggers something called Replicating Wilds, giving you multiple wild symbols on the reels of the game. The Feature symbol is responsible for starting up the free spins, and it’s the only one used for it. You can’t use the help of wilds to get it started. All free spin wins come with double the usual prize, thanks to a 2x multiplier. 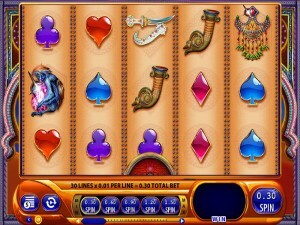 You receive 10, 20 or 40 free spins, depending on how many scatters were on the reels (3, 4 or 5, respectively). You can retrigger them, with the same number of symbols. While you use only one coin per line, you don’t have the option to reduce the number from 30, all of them being needed to cover all the lines. You can modify the line bet/coin value though, the range being between $0.01 and $3. 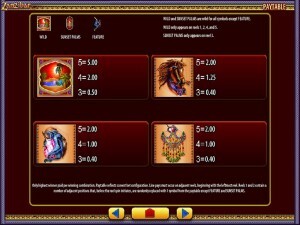 The slot’s biggest wager is worth $90, while the smallest one is $0.30. If you win the big prize, meaning that the wild gave you 500 coins, you will receive up to $1,500 from it. 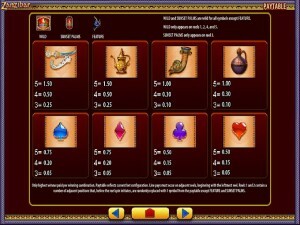 The game uses a mix of Arabian objects which look gorgeous, and poker card suits which are less glamorous. The surrounding graphics are the right ones, with beautiful decorations in place both behind and on the reels that you’re using. The themed symbols are mostly objects of Arabian design, intricate items which show how great their artisans are. Symbols: Oasis (wild, 500 coins), Sunset Palms (wild), Feature Logo (scatter), Horse (200 coins), Blue Creature (200 coins), Jewelry (200 coins), Dagger (150 coins), Golden Jug (150 coins), Sheath (100 coins), Jug (100 coins), Spade (75 coins), Diamond (75 coins), Clubs (50 coins) and Hearts (50 coins). Like many slots from WMS, it doesn’t give you much of a top prize, but I am satisfied with its features and even with most of the symbols and how they look. You will find Zanzibar at any online casino which chooses to use software from WMS, playable either for free or for real money.